I created this self-assessment tool several years ago but have adapted some of the language to correspond with BC’s new Draft Curriculum. While the format of a table has many limitations, I think the statements within it are helpful as part of a broader self-assessment strategy to stimulate student reflection on aspects of their learning. Core Competencies states, I am, because these competencies are habit-forming. One competency is the Thinking Competency including creative thinking. A student might write, “I am a creative thinker.” Obviously there are degrees to which a student is a creative thinker, but it is important that students begin to understand some of the attributes of successful learners and see themselves as acquiring these attributes, even if they are just beginning to do so. The I am could also tie in with learner profiles, Habits of Mind, or Virtues. The section on Influences on My Learning I think is most interesting for teachers. What students identify as the most important influences on their learning is important information for teachers to know so that they are aware of core elements to include in future instruction of a particular student or of that topic. For example, if a field trip, involving a lot of work and time was not included as an influence in learning, it might be best to not visit that space again. This is a tricky section of self-assessment though as some influences on learning are more visible than others. Reviewing this section with students specifically about what they learned from an influence would be helpful. The last section on Thankfulness was suggested to me by a parent. Learning is busy. It is easy to take for granted some of the experiences students have in their learning or perhaps have short-lived gratitude as attention is drawn to the next thing. I don’t think gratitude should just be an in the moment feeling of appreciation but recognized and appreciated over time. As I noted earlier, the format of a table is limited and perhaps the conversations the six statements elicit is more helpful. Feel free to use, adapt, or improve this table as you like. It is available here. Does learning in Kindergarten help with learning in Grave Five? Does learning in Grade Five help with learning in Kindergarten? Is it easy for teachers to quickly grasp the competencies students enter their classrooms with? Is it easy for teachers to quickly grasp the knowledge and understandings students enter their classrooms with? competencies, in BC’s new draft curriculum, could more fully be described as Core Competencies (Thinking, Communication and Personal & Social) as well as Curricular Competencies (skills that allow students to “do” a subject). Knowledge and understandings in the draft curriculum could be described as the Big Ideas and content and concepts in the Learning Standards. I think many educators would answer questions one and two differently if learning was separated into these two areas. Learning in Kindergarten and Grades One to Four definitely helps students learn in Grade Five. For example, students in primary grades learn how to read; students in Grade Five use reading to learn. Question two is different. Being a strong writer in Grade Five does not make a student better at letter formations in Kindergarten so in this way, learning in Grade Five does not help learning in Kindergarten. In this way, learning could be seen as linear. The same is not true if the learning we are referring to is knowledge and understandings rather than competencies. The experiences and learning a student has after Kindergarten will enlighten some of the experiences they had while in Kindergarten that they simply did not have enough experience or knowledge to comprehend at the time. In this way, learning knowledge and understandings is reciprocal: not only does our past experience help us understand our current learning, our current learning can help us understand our past. Two commonly used metaphors in education include the tree and the rhizome. The tree is an appropriate metaphor for the development of competencies. In the tree metaphor, there is a starting point – the seed – from which growth occurs in many directions in the form of branches and roots. The branches and roots divide and further divide and are only connected to each other where this division occurs, but not again. The second metaphor of the rhizome which has no beginning or end, only a middle. In the words of Dave Cormier, who writes on Rhizomatic thinking here often , “A rhizomatic plant has no center and no defined boundary; rather, it is made up of a number of semi-independent nodes, each of which is capable of growing and spreading on its own, bounded only by the limits of its habitat (Cormier 2008).” This metaphor suggests learning is linked not from beginning to an end, but that the brain complexly makes connection of learning from subject to subject, grade to grade, and all of the experiences beyond school into an interconnected and ever-increasing web where connections do not have to happen at defined intersections (as in the tree metaphor) but between any points. This metaphor validates past experience as rather than viewing it solely for the benefit of present understanding, it connects with and illuminates past learning as well. For teachers, this interconnected web of knowledge may make it challenging for teachers to answer question 4. It is fairly easy to know a students’ competencies including literacy and math skills., but it is far more challenging to know what they know and understand. But educators can try. The new curriculum anchors content and concepts to four to six big ideas per subject in each grade. Teachers in BC using the draft curriculum will have a great opportunity to connect learning not simply between big ideas within a grade, but between big ideas across grades. Doing so may jog a student’s memory to assist them with acquiring knowledge and understanding by making connections with what they already know and perhaps even provide a framework or at least some context to synthesize this understanding. Further, it provides an opportunity to honour what the student already knows and perhaps even develop their learning in previous grades. In this way, learning is truly reciprocal and interconnected. Not only does Grade Five benefit from Kindergarten, the learning that occurs in Kindergarten benefits from the learning of Grade Five and beyond. 1. The BIG Ideas, also known as Enduring Understandings. 2. The Learning Standards, which are most identifiable in the current curriculum as the Prescribed Learning Outcomes related to the Skills, Processes and Knowledge students are expected to attain for each subject for each grade. 4. And Implementation Links which are still under development. In speaking with students of outside45 shortly after they constructed canoe paddles with master boat builder Ian Magrath and their teacher Laura Magrath, it occurred to me that many students found their paddle instantly precious. 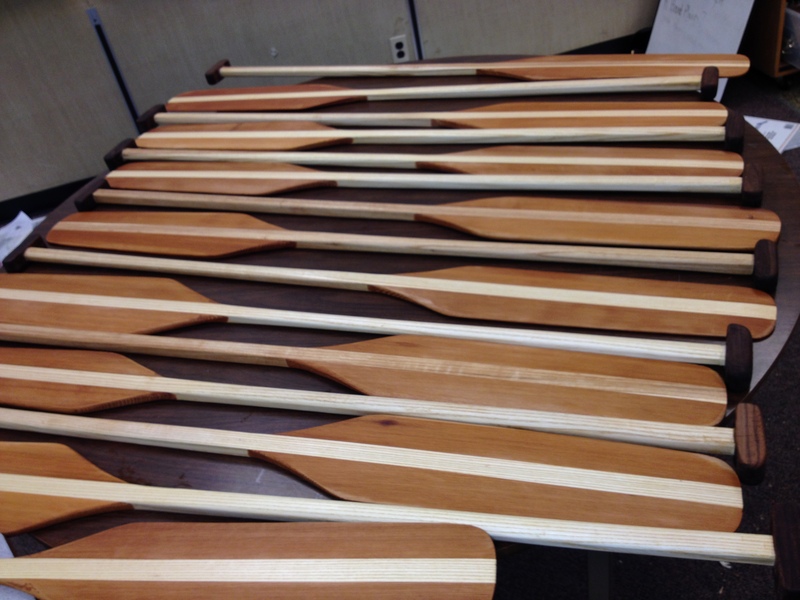 As soon as they planed and sanded their paddles, it became something they knew they would keep for a long time. The phrase, “We keep what we make,” occurred to me, and I began to think of learning. Do we keep our learning, meaning do we retain the knowledge, skills and understandings we develop, when we make meaning ourselves rather than this knowledge, skills, and understandings simply being transmitted to or at us. Educators often describe three approaches to teaching and learning: Transmission, Transaction, and Transformation. Transmission is where, in the words of John Miller, “the student receives and accumulates knowledge and skills.”[i] The knowledge and skills may be transmitted from the teacher, a textbook, a website, a documentary or other source. The information flows one way and is largely seen as fixed; in other words, while knowledge may be gained by others, what is known is not increased through transmission. Transactional teaching typically includes inquiry-based learning where students ask questions about a topic and acquire information to come to an understanding of the topic, and problem-based learning, where students are given a challenge they need to solve. The focus, according to Miller, is on thinking rather than feeling. This type of learning is linked to “constructivism” where students create their own meaning. My next blog posts will be on BC’s new Draft Curriculum and the transactional and transformational opportunities it offers teachers and students to construct meaning and keep their learning. [i] John P. Miller, Whole Child Education, some of which is available here. [ii][ii] More information on transformational learning as described by Andrew Kitchenham can be found in his article “The Evolution of John Mezirow’s Transformative Learning Theory,” in the Journal of Transformative Education here. How have Great White Sharks evolved? Has soccer equipment improved player performance? What does it take to survive on Mars? I’d love to spend a day researching each of these questions from our Grade 6-7 students. If only I had the time! The Grade 6-7 teachers at BICS understand that students likely feel the same way: They have interests that they would love to learn more about, if only they had the time. Although we provide opportunities within the BC curriculum for students to follow their passions, we felt it was important to truly honour, encourage and celebrate our students’ curiosity by offering them a day to inquire into any topic that interested them. This idea is not new. For years companies and schools have been providing “genius hours” which allow employees and students time to pursue their passions. Step One – Ask an “important“ question that is worthy of your time. We gave students a strategy called the Question Formulation Techniqueto pick a “big” question that would sustain inquiry. Students were asked as a class to create criteria for what constitutes important. Step Two – Share your question. Students shared their question on the website padlet (http://padlet.com/wall/openminds2013). This allowed other students and parents to see and respond to the questions of all 75 students participating. In one instance, a parent shared a student’s question with a professor and head of the Criminology Department at Simon Fraser University. The professor emailed the student’s teacher a page worth of fascinating questions that the student could consider. More importantly than receiving the questions was that the student understood that her learning was important enough to society that a complete stranger took the time to respond, in depth, to her learning. 3. Make your learning purposeful. Within five minutes of being released after instructions, all 75 students were fully engaged in their research. The focus of the day was on learning, not sharing. But, we believe that engaged learners want to share their learning so we used the afternoon for students to visit with other students to learn about their topics. Many parents joined in for this process. Students were given a marker and a piece of large chart paper as the only tools, other than talking, to share their learning; the focus was on content not presentation. After students spent the morning largely on computers, we wanted them to understand the importance of sharing their learning with others: not all information is on the internet and information that is available online is often scattered. It takes a person, a student, to synthesize this information into a format that makes sense for them and perhaps their context. For the last half hour of the day, students were given a reflection sheet which asked several questions related to their learning and the learning of others. Students were asked what they found challenging, what was something they did that they will use again, when and how they did their best work as well as what they would do next time. In response to the learning of others, students were asked what the most surprising thing they learned was, the most interesting thing, and something they learned that they want to remember. · Parents enjoyed the opportunity to engage with their child`s learning and the learning of other children. About twenty parents came for all or parts of the day; we even had a parent come to learn about her own topic, nicely modeling her passion for lifelong learning. · The involvement of parents and our school’s Principal heightened students’ beliefs that this day, this celebration of their curiosity, was important. · We have a truly remarkable group of grade 6-7 students who worked hard throughout the day with little prompting from their teachers. · Most students, not all, really enjoyed Open Minds. While teachers often see themselves as confined by time, it is refreshing to see ourselves as controllers of time as well. We have the ability to prioritize and make time for what we think is important. Open Minds has been a great way to make time for students to celebrate curiosity and explore their passions. Thank you to the grade 6-7 team of Mrs. Magrath, Mrs. Rogers, Mrs. Wilcott and Ms. Layzell (on mat leave) for helping plan Open Minds and with the writing of this blog post. 1. Click here for a post by West Vancouver Teacher Darren Elves for more information on student questions and the Question Formulation Technique. 2. Click here for other posts on inquiry at BICS. 3. Click on the files below to access some of the documents we shared with parents and students for Open Minds. If you are an educator, feel free to use/modify these documents. Inside Stories | on Moving or Wandering?